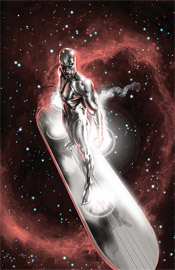 Of all of Marvel’s heroes, the Silver Surfer leads perhaps the most solitary, adventurous lifestyle. Since his expulsion as heir to Galactus, he’s aimlessly wandered the galaxy. Unsure of his ultimate goal, he’s frequently stumbled into stories involving the other characters in Marvel’s 616 universe, but never seemed to have a single, defining purpose. With In Thy Name, he may have finally found that direction, even if it’s come too late. Randomly discovering a utopian federation of planets and beings during his travels, (dubbed the Ama Collective) he’s taken it upon himself to aid one of the less-prosperous planets within the alliance. Brekknis, a downtrodden industrial planet, has been suffering at the hands of an enormous monster, and the Surfer aims to rid them of the beast. Simon Spurrier spins a complicated tale of religion eclipsed by civilization, then assimilated in the name of liberty. His story throws more than a few subtle jabs at the present political climate, but never comes off as heavy handed, never seems to be pushing too much of an agenda. The reader is free to enjoy the story as a purely fictional adventure through alien lands, or a clever parallel to more localized issues – it works in either context. The writer also showcases a real knack for characterization. Although I’ve only known of these characters for a scant twenty-some-odd pages, I already have a firm grasp of what makes them tick, of how they would react in a certain situation. Naturally, the Surfer himself is the real star of the show, and his loneliness and anger about the rest of the galaxy’s civilization is easy to understand. He truly comes across as a lonely, weary traveler – always willing to give the benefit of the doubt, but utterly fed up with being so frequently let down. Ever watched the news and shaken your head because humanity is so sickeningly predictable and closed-minded? You’ll identify with this take on the Surfer. Artist Tan Eng Huat is certainly up to the task of rendering a variety of visually unrealized alien creatures. His creativity seems boundless, although his take on the Surfer’s more humanoid anatomy is a little tough to grasp. His compositions are strong, with tiny accents and details thrown in almost poetically around the page. Where most artists would highlight the powerful force and destructive power of an explosion, Huat’s fireballs are much more organic, naturally flowing and almost beautiful. His grasp of a thriving, exquisite alien culture is also something to behold. His major sin, however, is in completely and inarguably overdetailing his work. His artwork is so complicated and busy that it will often stand in the way of simple legibility. While the Surfer battles that strange alien monster within the issue’s opening pages, it’s a dreadfully slow experience, the pages are stuffed so full of excessive detail and ridiculous linework. To be certain, Huat clearly spent an incredible amount of time and effort in getting these pages just right. This nigh-psychotic precision and focus is generally something to be savored and enjoyed, but when your readers are spending minutes at a time simply trying to figure out what’s going on, that’s time they aren’t spending appreciating the artwork. Huat has tremendous potential, especially within a story like this one where his imagination can flow forth uninhibited, but he needs to reign it in a bit. There are times when the artwork should be king, and times when the storytelling should come first. This is a beautiful series, and it’s a shame that it hasn’t received more attention than it has. Simon Spurrier does a tremendous job of dropping the Surfer into a rich alien culture, wrought with political upheaval. It’s a great blend of fierce action, rich drama and intelligent observation. On the other hand, Tan Eng Huat’s brilliant character designs and amazing anatomical renderings are tempered by a tendency to overcomplicate things. This is worth buying, even if you’ve never been much for the character himself. With a few different artistic choices, it could’ve been even better than it already is.